Bovey Castle is a 5 Red Star country resort, set in a 275 acres estate, located in the heart of Dartmoor National Park, in Devon. The hotel’s plush accommodation is divided between 60 uniquely appointed rooms in the manor house and mews, and the 22 lodges nestled in the grounds. For golfers, the course at Bovey Castle is a challenging and beautiful 18-hole championship course, designed in 1926 by J F Abercromby, one of the finest British golf course designers of the last century. When the course opened in 1930, it quickly gained national acclaim for its reputation as one of the most enjoyable places to play golf. Golf day packages start at just £37.50 per person during the winter, including breakfast and a round of golf up to a full day’s hospitality, with breakfast, lunch, dinner and golf included. The golf team can include personalised scorecard preparation and complete management of the golf event. Bovey Castle truly is the perfect venue for your next golf day. bacon roll in Smith’s Brasserie before your round of golf. • 18 Holes, Breakfast & Lunch, from £49. • 27 Holes, Breakfast, Lunch & Dinner, from £125. 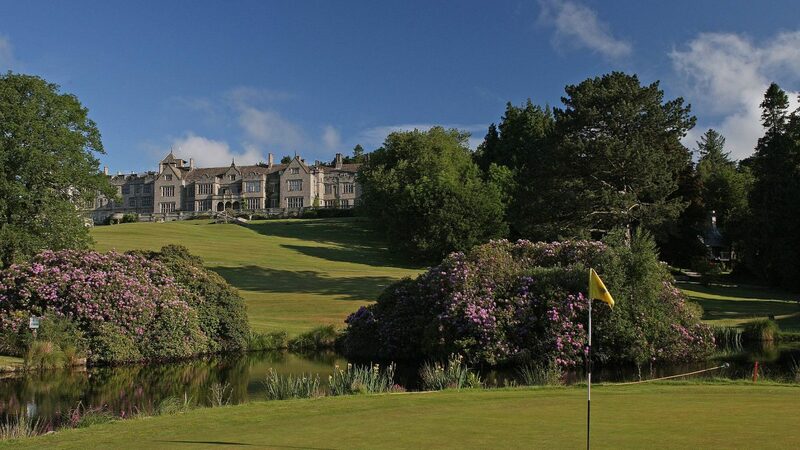 Enjoy a full days golf and hospitality at Bovey Castle.